Many anxious Indians have been flocking to banks to change money that is no longer legal. Among them are worried housewives who had saved up cash "secretly" for years. The BBC's Vikas Pandey meets some of them. People formed long queues at banks on Thursday waiting to exchange 500 and 1,000 rupee notes after they were withdrawn on Tuesday night as part of anti-corruption measures. Most Indian housewives are in the habit of saving small amounts of money, often taken from their husbands' earnings. In many cases significant amounts of cash have suddenly been declared worthless. Indu Mehra lives in Delhi's Karol Bagh area and has been quietly saving little amounts for more than 10 years. Her husband, who runs a business, didn't know about her savings until Wednesday. "I frequently got cash as gifts from my parents and my husband for more than 10 years. This amount was meant for rainy days and my husband and children didn't know about it, but now they know. "I support Mr Modi's move, but I don't like the way he did it. He should have given us some notice, then I may have been able to quietly change my savings without my husband getting to know about them. "Also, I have seen daily-wage labourers struggle to buy basic things like food and milk in the last few days. 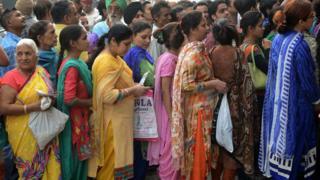 Given the queues at banks today, their situation is unlikely to change for a few days." Priya Rohtan didn't want her husband to know about her savings, and said he was "shocked" after he found out. "I never told my husband about my savings because I feared that he would spend it. I saved money from his earnings only, but didn't want him to know. I saved for my two children's future. "When I told him on Wednesday that I had some extra cash savings, he was shocked. But he started laughing at the fact that I saved money from his earnings and he didn't know about it. I don't know about corruption and demonetisation, I am just angry that my savings system has now been disrupted." Kiran Rajpal was queuing up at a bank in Delhi along with her daughter to deposit her savings into her account. She says that she will tell her husband only after she manages to deposit them into her account. "I don't think my husband is going to be upset when I tell him about my savings. I think he will see the point that I saved, mostly from his salary, for our children's future. I don't think I have done anything unusual, every Indian woman has a secret savings box that she keeps for emergencies or occasions like birthdays and weddings. "Ideally, I wouldn't have liked my husband to know about my savings. But at the same time I agree that this [banning currency notes] had to happen because of so much corruption around us." Asha Chhabra says she has never faced any crash crunch in her life, but "still saved little amounts frequently". "I started saving more after getting married about 30 years ago. My husband runs a transport business and we have never faced any cash shortage, but I still preferred to save. I didn't tell anybody in the family about my savings, but now they will all find out after they see my bank account details. "I am not worried about going to the bank to deposit my savings because it's all legal, and I have accumulated it over several years. Also, I am not sure about my husband's reaction when he finds out. I think he will be fine with it." Sunita Saigal is a school teacher and supports the government's decision. She says she doesn't mind "little problems like queues" because it "will reduce corruption". "It's okay that women like me now have to reveal our secrets. But we shouldn't worry because we save for our families. I have given money to my children and husband so many times from my savings box, but I always ensure that I keep replenishing it. "I will continue to do that, just that now my savings secret won't be a secret any more."